Are you a business-to-business sales juggernaut? Do you have proven boardroom sales experience at senior executive level? Are you looking for a career in sales that is truly impactful and will change people’s lives? If you answered yes to all three questions, you need to pay attention to this vacancy at Raizcorp! Raizcorp is Africa’s premium entrepreneurial incubator and is changing not only the lives of thousands of entrepreneurs but also directly impacting their families and communities. We are offer a unique opportunity for you to use your sales strengths to change people’s lives and positively impact communities across South Africa. We are looking for a sales juggernaut – that rare person who is an outright B2B sales champion and also looking to create impact and change in South Africa through their career. You will be aggressively approaching corporates, creating solutions with senior executives around their B-BBEE needs, and creating programmes for entrepreneurs to grow and develop their businesses into sustainable, scalable enterprises. The work we do is tangible; you will see the entrepreneurs develop on their programmes and walk a journey of growth with your clients. 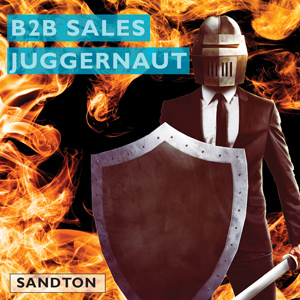 What does a B2B Sales Juggernaut do? A B2B Sales Juggernaut is responsible for proactively and zealously developing and establishing new corporate business, maintaining key relationships with existing clients and selling Raizcorp’s offering to both. The results of your efforts will see entrepreneurs across South Africa selected for specially designed programmes through which Raizcorp will guide them to business success – changing lives and positively impacting sustainable business for our country. Do I need to be experienced in B-BBEE to apply? No. We will aggressively train and develop your knowledge and skill in this field. You need to be aware of the fact that you will have to learn the codes and become a specialist in your own right. We have a Sales Academy that will ensure that we constantly hone and refine your skills. You do, however, need a solid background and experience in B2B sales, especially solutions-based sales. We do not accept applicants who do not show a stable and successful corporate sales journey. You would be selling Raizcorp and relevant products to a corporate market. What you need to know is that we don’t have one single product but rather create bespoke solutions that meets our clients’ exact needs. This means that you need to become a specialist with a wealth of knowledge and that you are able to listen and think on your feet in boardroom situations. Before you get too worried, it’s important to know that we provide class-leading training and support. Minimum of seven to ten years’ solutions-based B2B sales experience. Corporate solutions selling experience is non-negotiable. Proven ability to present and sell at boardroom level. A tertiary level qualification in sales, marketing or commerce.